Don't miss "STATE OF THE COUNTY", our next Hot Topic! 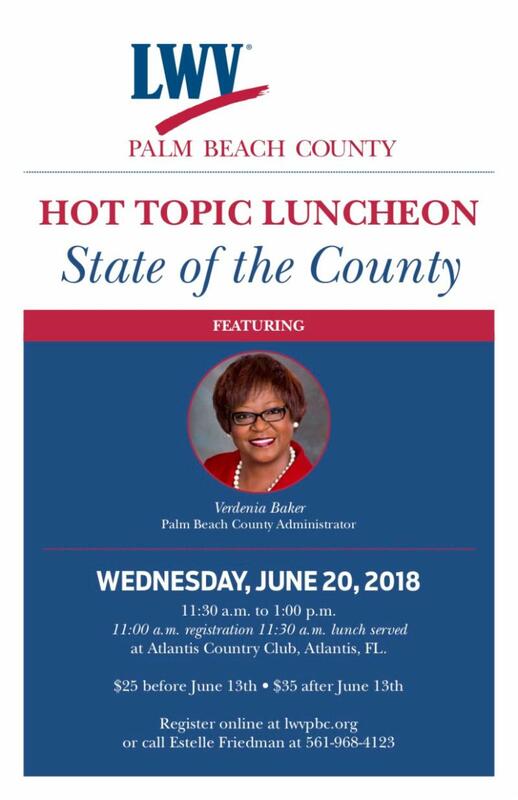 Wednesday, June 20, 2018, 11:30 a.m.-1:00 p.m.
Palm Beach County Administrator, Verdenia Baker will address County issues and concerns. Ms Baker is responsible for carrying out the policies of the Palm Beach County Board of County Commissioners. A certified financial manager, she manages the daily operation of county government, which includes more than 6,300 employees, an annual budget of approximately $4.4 billion, and serves a county population of more than 1.4 million residents. The cost is $25 if you register before June 13, $35 after. Either click the button below or call Estelle Friedman at 561-968-4123. Wednesday, July 18, 2018, 11:30 a.m.-1:00 p.m. The 2020 census is only two years away, but many are unaware of the problems the Census Bureau faces. The Bureau is dealing with budget cutbacks, a lack of leadership, failed field tests, and more. These problems alone have the potential to seriously hurt the success of the census, but the introduction of the citizenship question to the document raises many problems that will have long lasting, negative effects. 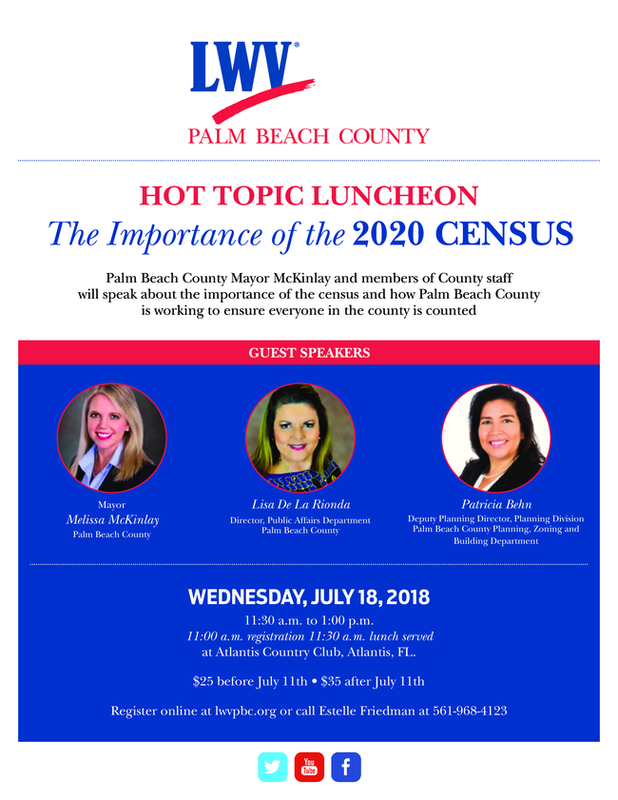 Palm Beach County Mayor McKinlay and members of the County Administration staff will be talking about the importance of the Census and how Palm Beach County is working to save the Census at our Saving the Census Hot Topic lunch on Wednesday, July 18, 2018, 11:30 a.m. – 1 p.m. at the Atlantis Country Club. You can register at lwvpbc.org . The census touches every aspect of our lives. Don’t miss out on learning how to help it succeed in representing EVERYONE. Linked below is an informational video that discusses the many issues plaguing the success of the census including the citizenship question. REMEMBER: For Democracy to work, we must vote. Be an informed voter! Hot Topic Streaming begins at 12:10 p.m.
﻿Cool Topic Streaming begins at 9:10 a.m.
You can view Streamed events on LWVPBC Facebook Live. We are converting our LWVPBC website and online systems to a new, integrated membership system called Club Express (CX). CX makes it much easier for us to relate to you and do all kinds of things that are related to you, our members, such as accounting and dues management. It allows us to expand the information we have about you and what you are interested in and the information is more secure. CX offers many new options and features, such as the volunteer system which allows you to post events and sign up volunteers to work at these events. We will use the volunteer system to manage voter registration, a critical effort in this mid-term election year. There will be differences, and questions. Our lwvpbc.org website will look different. Our twice-monthly newsletter will look different; and especially our Members Only information will look different and there will be more of it. Instead of a generic password, you will be required to create and use your own password. You will be able to sign up for events more easily and take advantage of Member rates. You will receive a letter welcoming you to the new system shortly. If you have technical problems, please email them to help@lwvpbc.org . Enjoy our new system. Our 2018 interns, Naya Payne and Christina Pugliese have joined the League and begun working hard. We were delighted to meet them and proud to work with them over the coming months. They are sure to make a positive difference. Naya Payne graduated from Wellington Community High School. 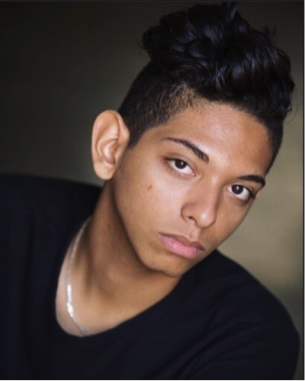 He will be attending the University of South Florida in St. Petersburg in the Fall where he will be studying Political Science. Naya volunteered with the League as a result of his passion to find ways to improve and strengthen American society for everyone. He feels that “the League represents his core values” and that participating as a member and an intern will provide him with skills that will help him further the goals in his life. We are delighted to welcome Naya to our intern team and feel certain that his research and technical skills as well as his interpersonal skills and drive to make a difference will be of great value to our League. 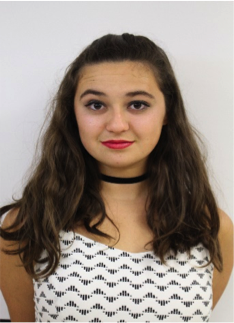 Christina Pugliese is a recent graduate of Palm Beach Central High School. She will be attending the University of Florida in the Fall to study Telecommunications, Political Science, and History. Pugliese wanted to be the League of Women Voter’s intern so she could help improve Palm Beach County’s voter turnout rates. She has done this through her involvement in political events. She has also interviewed political candidates and figures such as Dr. Ben Carson, the current Secretary of Housing and Urban Development. In her free time, she loves to volunteer around Palm Beach County with the UNICEF club she founded as well as lead her school’s award-winning newspaper, The Bronco Beat. She hopes to make her community a more politically active place through her work with the League. This past May, LWVPBC welcomed our 700 th member and we are proud. Although the League of Women Voters was established in 1920, it wasn’t until 1958 that the Palm Beach County chapter was formed. As we continue to grow, know that our voices are being heard and each member contributes significantly through donations, attending events and advocacy. Now that we know our power let’s see how fast we can make it 750! Connecticut became the eleventh state to pass national popular vote legislation in May, and almost simultaneously, many League members in Palm Beach County expressed a strong desire to support NPVIC—the National Popular Vote Interstate Compact—to align the electoral system with the will of the American people in presidential elections. They are signing up to learn as much as they can about NPVIC and how it would work if enough states pass it to equal or surpass 270 electoral votes needed to win the presidential election. 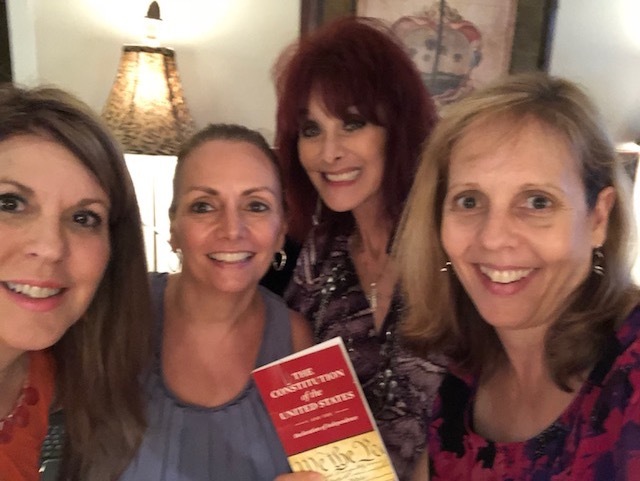 ﻿Carol Nikov organized the May 19 orientation, and Lorna O’Connell and Cynthia Archbold held another June 2, to explain how NPVIC works— how the compact guarantees that the candidate who wins the most popular votes will become the U.S. President. 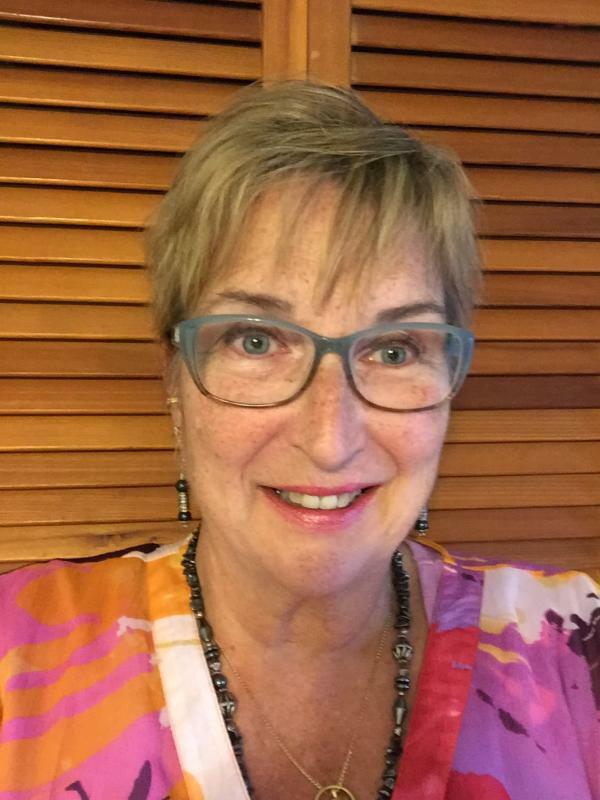 Palm Beach County Leaguers, led by Kathleen Crampton are working to get league chapters across the state and across the nation to make NPVIC a high priority issue. 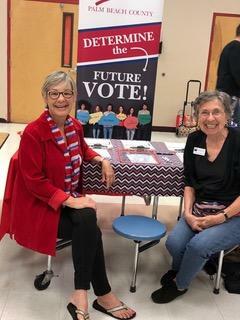 They hope with enough encouragement from the LWV and voters, lawmakers will sign NPVIC into law in Florida, and also in other states in time for the 2020 presidential election. With more than 500 miles of canals and 20 major water control structures, the Lake Worth Drainage District (LWDD) is one of the largest drainage districts in Florida. The agency’s water managers are responsible for the operation and maintenance of this extensive canal network to serve more than 750,000 residents and several thousand acres of agricultural land. The Canal Maintenance program began in 2015 in order to keep the canals and rights-of-way clear. In the past, residents cluttered the rights-of-way with patio furniture, swing-sets, fences, vegetation, and even boats. During a storm, these items can easily blow into the canals and block the drainage pipes causing localized flooding. 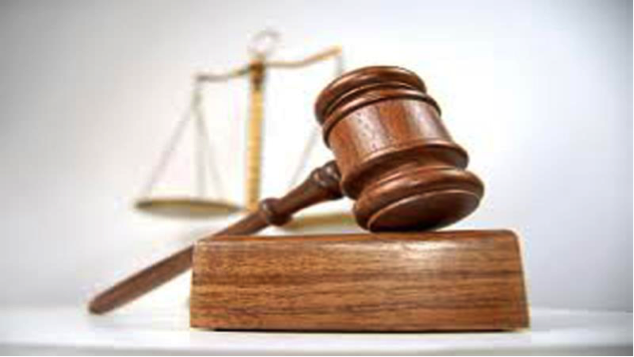 Residents guilty of encroachment are notified and provided time to remove or relocate identified items. These items not only cause blockages and drainage problems, but they also impede canal access for ongoing maintenance and emergency response. Any remaining encroachments are disposed of by the District. Flood control is a shared responsibility through a three-tiered drainage system. Neighborhood drainage systems are operated by property owners or residential associations. Secondary flood control canals are operated by the LWDD, and primary flood control is provided by the South Florida Water Management District (SFWMD). The LWDD works closely with the SFWMD before, during, and after rainfall events to provide flood control for the residents of Palm Beach County. During normal operations, LWDD staff must have clear access to canals for routine maintenance and debris removal. During emergency operations, access is essential as LWDD staff and larger equipment must quickly navigate the canal system. Keeping the rights-of-way clear is an important public safety role for residents. REGISTRATION NUMBERS ARE ON A ROLL! Our spring voter registration campaign targeted local high school students. We attended 23 events at 12 different schools, engaging graduating seniors on check-out days (when they pick up their caps and gowns) and other students at special events such as commemorative rallies for Parkland and Columbine. In what was a hectic two months, we often had multiple activities on the same day and our volunteers outdid themselves. Our results between mid-March and the end of May were truly stellar, with 1384completed registrations! CONGRATULATIONS and THANK YOU to our amazing volunteers! The National Council of Jewish Women (NCJW) is now collaborating with the League on voter registration, and a large, enthusiastic group of volunteers has already received training. They are anxious to get to work. Our emphasis this summer will be on eldercare facilities, with a program we have called “Voting is Ageless.” Rebecca Cohen and Bonnie Greenberg are heading up teams in North and South County, respectively, that aim to visit as many independent living facilities as possible. We look forward to having the same success at the other end of the age demographic as we did with high schoolers. Working with the assistance of Councilwoman Ka’Shamba Miller-Anderson of Riviera Beach, our new committee Co-Chair, Robin Sambur, will be organizing registration efforts aimed at large industrial concerns, religious institutions and community organizations. Experienced registrars are needed! Aside from our summer activities, we are preparing for National Voter Registration Day on Tuesday, September 25, 2018. That day, in conjunction with Palm Beach Schools, the League will register students and staff at 23 high schools throughout the county simultaneously . Needless to say, we will need many trained, experienced volunteers! If you would like to be a part of our important voter registration efforts and need training, or if you need a refresher, please contact Pam Maldonado. RSVP IS REQUIRED to Pam at 9305)873-4239 or maldonadopbc@gmail.com. So, we didn't move the News platform...yet, as I am a slow learner. Next month we will try again. LWVPBC is preparing to produce our premier publication, The Voter's Guide. We need your help in distributing it in your local neighborhoods, home or work. The county has been divided into four districts, north, central, south and west. This publication is produced biannually, and is an insert in the Palm Beach Post home delivery. It is a "must have" for knowledgeable voters, and especially needed this year due to the number of ballot issues. Please help your League by volunteering to take it to locations like libraries so it can be widely distributed. To volunteer, contact Joyce Sullivan at jtfsullivan@comcast.net . As always, please send your comments and suggestions to me at dachandler55@gmail.com .